An inviting lawn and garden is one of the greatest benefits of owning a home, but to get the most out of these spaces, you need to be able to enjoy them in peace. A privacy fence lets you do that. With a well-designed fence, you can enjoy a meal, sunbathe or just tend your flowerbeds while comfortably shielded from the gaze of neighbors and passersby. Privacy fence designs range from formal and forbidding to charming and welcoming. In addition to their look and feel, fence designs vary in the amount of privacy they provide. Because your fence affects the ambiance of your whole landscape, it’s worth taking some time to get familiar with the options available, and then weigh the pros and cons of each. This type of fence is one of the most popular for creating privacy. In this design, boards are placed on alternating sides of the central rail creating an overlapping pattern that looks the same on both sides. The simple construction method makes this fence among the least expensive to build. When used for privacy, the boards are typically placed close enough to eliminate gaps between the boards’ edges, completely blocking direct view. Thanks to the space between the boards’ surfaces, however, the breeze can still pass through. On the down side, this space also makes it possible to see through the fence at an angle. This type of fence has boards fit together tongue-and-groove style to create a solid panel that blocks the view. The clean, uniform design can smoothly follow the contours of hilly land. Because it doesn’t draw attention to itself, it fits well with any home design. Solid fences like this also block airflow, which can be a plus in a windy area, but a disadvantage if you rely on air movement for cooling. A convex fence is built from boards placed side by side, with the height of the fence rising and falling in a wave pattern. The boards can be placed close together to create more privacy or spaced farther apart to allow some view and let the breeze through. This fence’s graceful appearance makes it well suited to homes in upscale neighborhoods. Thanks to its simplicity, it fits nearly any architectural style. The appealing name of this fence reflects its charming, homey appearance. The top of each board is cut down on either side to give it a more rounded shape. Other shapes are also available. The boards are placed side by side, creating a bumpy pattern that’s less monotonous than a flat-topped fence. Because of the uniform shape of the boards, it’s easy to modify the fence design where necessary to better fit with the landscape. If security is a top concern for you, a stockade fence is a wise choice. These fences consist of side-by-side boards that each have a sharply pointed top. This design creates a jagged edge along the top of the fence that discourages any would-be climbers. 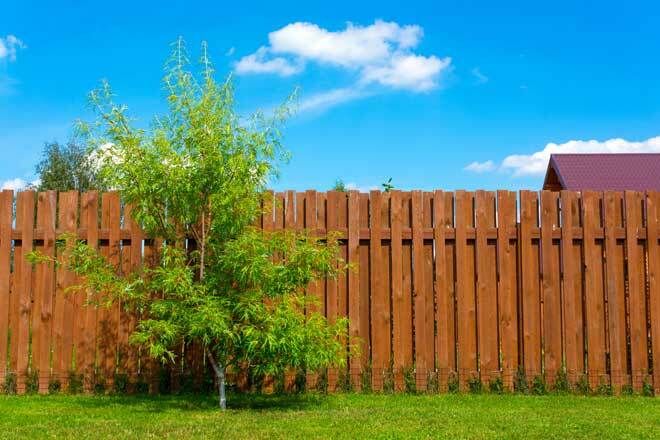 Like many highly secure fences, however, a stockade fence has a somewhat unwelcoming fortress-like appearance that can affect the overall feel of your yard and garden. As an alternative, consider Gothic point fence boards for a more decorative look that doesn’t sacrifice security. A lattice fence, created from narrow boards installed in an open criss-cross pattern, is among the more decorative types of privacy fences. While it offers only limited privacy by itself, you can further block the view by training a climbing vine on the fence. It’s the perfect solution if you’d rather look at greenery than fence boards, but you want something more secure than hedges. Another option is to install a solid-panel fence, such as a lock board fence, with lattice detail on the top. The fence boards protect most of your yard from prying eyes, but the lattice top adds an airy, open appearance so you still feel connected to the rest of the neighborhood. The quintessential symbol of a happy home, this fence goes a long way toward making your property feel warm and inviting. Traditionally, the pickets have a gap of one picket-width between them, meaning the fence will obscure the view somewhat, but not block it. If you like the look of this fence, but want a little more privacy, the pickets can be placed closer together. In addition to deciding on which privacy fence design best meets your needs, you’ll also need to decide on the material you want to build it with. 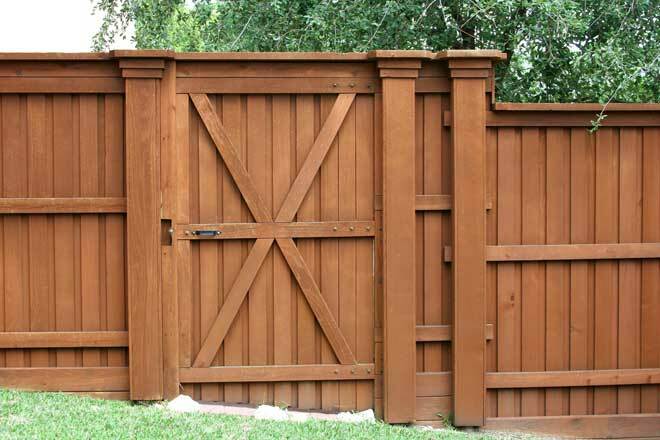 Wood – As the traditional material for privacy fences, wood suits nearly every type of home and landscape. Among the preferred wood species for fencing are pine, fir, spruce, white oak, and western red cedar. Because pine and fir fence boards are typically pressure-treated, a process that involves toxic chemicals, other species are a better choice if you have children or pets. Wood of any type requires regular maintenance to protect it from pests, rot, warping, and other damage. Vinyl (PVC) – If you’re looking for a low-maintenance alternative to wood, consider vinyl. Vinyl is stronger than wood and doesn’t rot, warp or attract pests. Soap and water are all you need to clean it. It even resists paint, so removing graffiti is no problem. While you can’t paint a vinyl fence to match your home, vinyl fences are manufactured in a wide range of colors, so it shouldn’t be hard to find one that appeals to you. 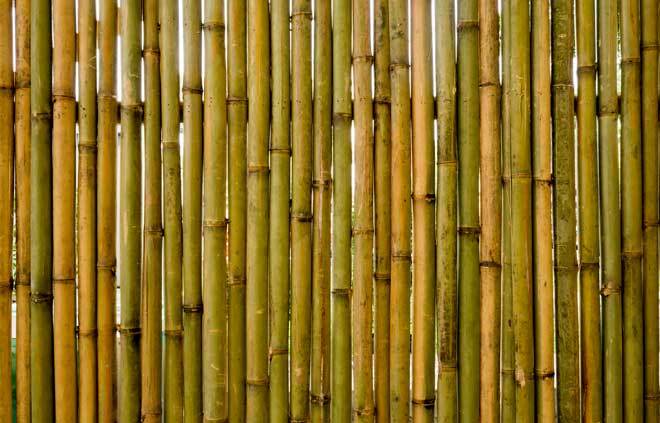 Bamboo – Bamboo fencing is both budget-friendly and environmentally friendly. In these fences, bamboo poles are tightly connected to create a fence that completely blocks the view. Bamboo perfectly fits the aesthetic of a tropical landscape design, but it doesn’t hold up well in cold climates. A privacy fence can make your yard and garden a much more comfortable and enjoyable place to be. Whether you want a fence that lets the breeze and light in or one that provides complete seclusion, there’s a privacy fence design that will get the job done.